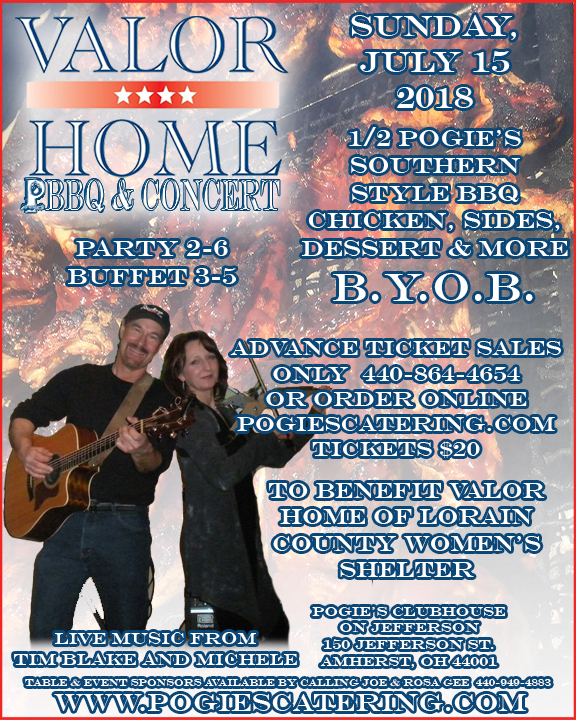 The Valor Home of Lorain County Women's Shelter will have a backyard bbq and concert benefit at Pogie’s Clubhouse on Jefferson on Sunday July 15th. 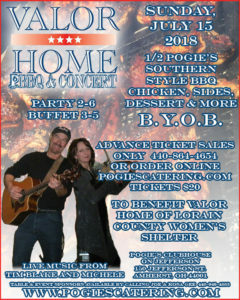 Live music from Tim Blake and Michele will keep the party going as Pogie’s cooks up a southern style bbq chicken dinner. Tickets are $20 apiece and can be purchased online HERE or by calling 440-864-4654. Tim Blake is a musician-entertainer from Lorain Ohio. He has been playing guitar and singing live music at clubs, special events, bars, parties and festivals in Northern Ohio and at the Lake Erie Islands for over 35 years. His single “Jewel of the Port” tells the story of the Lorain lighthouse and its return to glory after years of neglect. The song was featured in a PBS documentary about the many lighthouses of the Great Lakes. Versatile Cleveland musician Michele George has played violin and viola with regional symphony orchestras throughout Ohio, Pennsylvania, and West Virginia, as well as for productions at Playhouse Square and the Cleveland Playhouse in Cleveland, Ohio. She has shared the stage with George Benson, the Trans-Siberian Orchestra, Rosemary Clooney, Roy Clark, Hawkwind, Meatloaf, and Il Divo. As an electric violinist in Cleveland, she has played with the award winning experimental space-rock band Einstein’s Secret Orchestra, the Tellers, Witch Disco, and has made appearances with Moss Stanley’s Nitebridge. Valor Home Lorain County provides transitional housing for homeless veterans in Lorain Ohio. A portion of the proceeds will be donated to the Valor Home of Lorain County Women's Shelter. Pogie's Catering © . All Rights Reserved.